What is a Pump and Tank Fire Sprinkler System? If the town water main criteria cannot be met then your sprinkler system would have to be fed from a stored water supply. From here we attach a self-testing pump to ensure that the water can be supplied to all the sprinkler heads. The size of the tank is designed by the hydraulic calculations of the system using the number heads determined by the category. BS9251:2014 states typical volume of tanks as Cat 1 1500 litres, Cat 2 3000- 4500 litres and Cat 3 6000-9000 litres. Should a tank have a proven infill (through a 32mm @ over 1.2 litres per second (cat 1) 50mm (cat 2-3) @ 2 litres per second) then the water storage capacity could be reduced by 40% assuming building control are satisfied with this. Existing water tanks can be used assuming that the above volumes can be guaranteed for the use of the sprinkler system. Boosted mains water supply system can also be utilised if sufficient water storage is available. 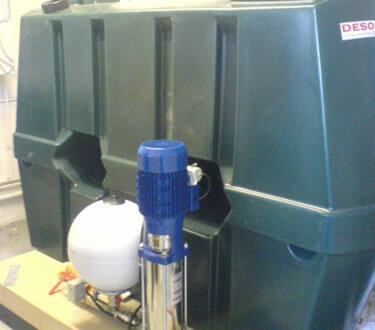 The image above shows a domestic water tank and self-testing pump. This system will provide the building with a 10 minute operational run time. Ultrasafe have many years of experience designing, installing and commissioning pump and tank fire sprinkler systems. If you would like to see some examples of our projects see our pump and tank fire sprinkler system case studies.